Hyundai's 60-second first-quarter spot touted its Shopper Assurance program, the foundation of its retail strategy intended to make buying more convenient for consumers. After automakers ran 11 spots in 2018, including five from Fiat Chrysler Automobiles, that total dropped to just six this year (including two from Toyota). 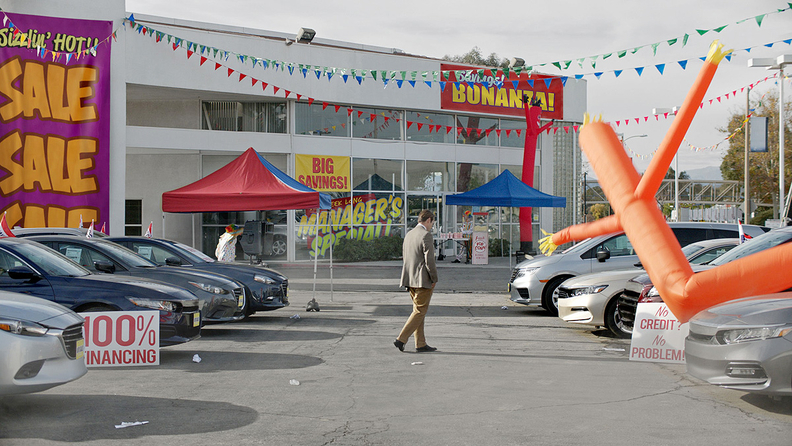 Hyundai's 60-second first-quarter spot touted its Shopper Assurance program, the foundation of its retail strategy intended to make buying more convenient for consumers. It starred actor/producer Jason Bateman, and gave the world a look at the upcoming Palisade, the brand's three-row flagship crossover. The traffic results were basically a first-come, first-served situation on the site, where the results closely mirrored the order in which brands' spots aired. Other than Mercedes-Benz, the third auto spot that ran, and Audi, the second auto ad -- which flipped places in the rankings at second and third, respectively -- the other brand lifts followed in chronological order. Kia's third-quarter spot was the last auto ad to run, and it finished in sixth place after not seeing any lift. The brand's traffic declined 14 percent from the comparison period. The spot tapped into the working-class spirit of its West Point, Ga., manufacturing base while showcasing the three-row Telluride crossover that is built there. Cars.com also reported that 74.2 percent of its traffic during the game came from mobile devices, up from the 69.2 percent before the game. Cars.com says its site traffic data were collected in real time, and performance of TV commercials was measured by comparing the eight minutes immediately before and after each spot aired. The less-cluttered stage turned out to be a playground for vehicles that haven't gone on sale. The Audi e-tron GT, Mercedes A class and Toyota Supra were the other products. "Having less concentration of brands does allow a brand to stand out. None of the domestic brands came to the game last night. It's hard to say whether that made a large impact in capturing attention. Certainly, you didn't have the behemoth brand vehicles like the pickups that are always highly successful," David Greene, Cars.com's senior marketing data strategist, told Automotive News. He added: "The vehicles that did get advertised last night -- none of them are on sale. In the case of Audi, [the e-tron GT is] in a late-stage concept phase. This was definitely a different tactic than some the past year's commercials." FCA left a huge void by sitting out for the first time since 2009, but the automaker's digital push with a series of ads for Dodge, Jeep and Ram that released last week may have helped. Cars.com reported that FCA's share of traffic on the site rose 1.1 percentage points during the game to 14.4 percent. The lift was driven by Ram, which also had a Twitter collaboration going during the game to hawk the 2019 Heavy Duty with several other products. • Audi's "Cashew" spot was the big winner of the night on Edmunds, driving the most traffic growth for a brand at 116 percent. The e-tron GT, even though it's not on sale, had the highest traffic lift among vehicles at 13,578 percent. • On CarGurus.com, the A class tripled from .0264 percent of all model searches (new and used combined) on Saturday to .0787 percent of all model searches on Sunday. The share of new searches for Mercedes as a brand was up 0.7 percentage points day-over-day from Saturday to Sunday, and it's currently 4.5 percent of new searches, which is its highest so far this year, the site said. • The share of new car search for Hyundai on CarGurus.com is up 0.6 percentage points from 3.1 to 3.7 percent, which is its high for the year so far, the site said. This bucks a Super Bowl advertising trend on CarGurus, where searches normally increase at the model level, but not the brand level. • EDO, a company that measures the real-time impact of TV advertising by capturing minute-by-minute changes in searches and other online actions that are directly triggered by exposure to a TV ad, said Toyota had a good night. The company found that Toyota garnered the highest percentage of online activity after its ad airings with 45 percent of all automotive searches.